Guest blogger Emily Stewart, M.Ed., is a third grade teacher at Murch Elementary, a public school in Washington, DC. 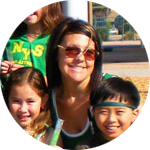 During the 2012-2013 school year, Emily will be sharing the real-world strategies, challenges, and successes of implementing ELA Common Core standards in her classroom. One of the goals the writers of The Common Core Standards had in mind was to build natural collaboration and discussion strategies within students, helping to prepare them for higher levels of education and collaboration in the workforce. In our Common Core classrooms today, students are being asked to incorporate multiple strategies, complex texts, and evidence-based responses. When faced with this overwhelming task, we must put many building blocks in place for our kiddos to be successful. Buddy Talk — a best practice — benefits everyone in the classroom. Of course we know buddy talking is important, but in the Common Core classroom, Buddy talking is IMPERATIVE. Peer explanations give students an active role in learning and create an entirely new level of scaffolding for students, which we as adults don't quite fit into. It enables students to take their thinking and articulate it into words, which allows their brains to build and make connections that would typically not occur. Furthermore, the listening component of buddy talking allows students to hear the thinking of their peers, which helps them to clarify their own thoughts. Teachers can utilize buddy talking in many ways, every day: formative assessments, simultaneous engagement, closing a lesson, discussion of vocabulary, breaking down of concepts by students, and connecting with prior knowledge. However, the prime purpose for buddy talking is to provide students with another opportunity to connect with the new learning in order to make it their own. Plan — When planning your lesson, plan specific times when buddy talking will be imperative to student understanding. Write questions ahead of time to ensure that they are higher level, and not formed "off the cuff." Also, make sure that your questions build on one another, which lends to ideal scaffolding opportunities. Write questions on post-its and place them in the text to indicate where questions should be asked. In guided reading, I have my own copy of the text we are reading, which has the questions written in it before we read. This way I remember what questions I asked at certain points in a novel discussion, and will have them for the next time I'm teaching the novel. Pose — When posing the question, make sure you have strategically paired up your students with other students who can initiate thoughtful conversations. Your ESL learners should be paired with a student with an average vocabulary. Your higher students should be paired with higher leveled thinkers, and your average students can be paired with average to high-average thinkers. Have students sit criss-cross, knee to knee, so they can see eye to eye. Also give students indicators of who's talking first. I like to have students pick whether they would like to be Partner Peanut Butter or Partner Jelly, Partner Rain or Partner Boot, etc. Then you tell them who's talking first. Wait — Students must have an adequate amount of wait time after you ask the initial buddy talk question. The average teacher waits 3 seconds for a student answer, however most students need 10-15 seconds, or more, to formulate an answer. The higher leveled questions that we should be asking to align with the Common Core sometimes incorporate two or more components, which will require adequate wait time for students. During this wait time, repeat the question, as well as provide supporting questions and scaffolds where appropriate. Monitor & Feedback — Students should take turns talking. Explicit buddy talking that is intended to lead to a deeper understanding should include opportunities for students to listen to each other's thoughts. The teacher, should also be listening to students as they are responding, to check for understanding. Monitoring conversations will also help teachers to provide feedback, clarify misunderstandings, and ensure that all students are appropriately engaged. Monitoring will also enable teachers the opportunity to identify students whose thinking will benefit the entire group. I try to choose 2-3 students who have mastered the intended understanding, included key vocabulary, and made higher leveled connections that other students might not have made on their own. Write — In the final steps of buddy talking, students should have an opportunity to solidify their understanding by piecing together their original thoughts, as well as thoughts they heard throughout the buddy talking session. Writing can serve as a formative assessment for the teacher to identify students who have built the connections and learning intended. One last thing you can do to help students be successful buddy talkers throughout the year is to set up an environment so students have access to a natural buddy. My students sit facing another student, which allows a natural pairing. I also have control over the seating chart, so their buddy can be changed based on the needs of students. In the end, however it's phrased: Buddy Talk, Think-Pair-Share, Accountable Talk, Classroom Chat, Turn and Talk, and many others, we just need to get our kiddos talking! Any opportunity for students to make connections with new learning is critical and essential to student understanding in the Common Core Classroom. BUILD those connections, CHALLENGE that thinking, and give students the tools to DISCUSS!